Pictograph or Pictogram are pictures which contains the hidden words, phrases or English idioms. It is also known with the name Rebus. In these rebus puzzles, your challenge will be to find the hidden meaning of the given puzzle images. 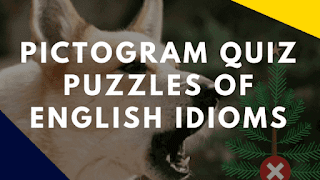 There are 5 pictograms in this video and answers of these rebus puzzles are given in this puzzle video. Post your answers for these rebus puzzles in comments.